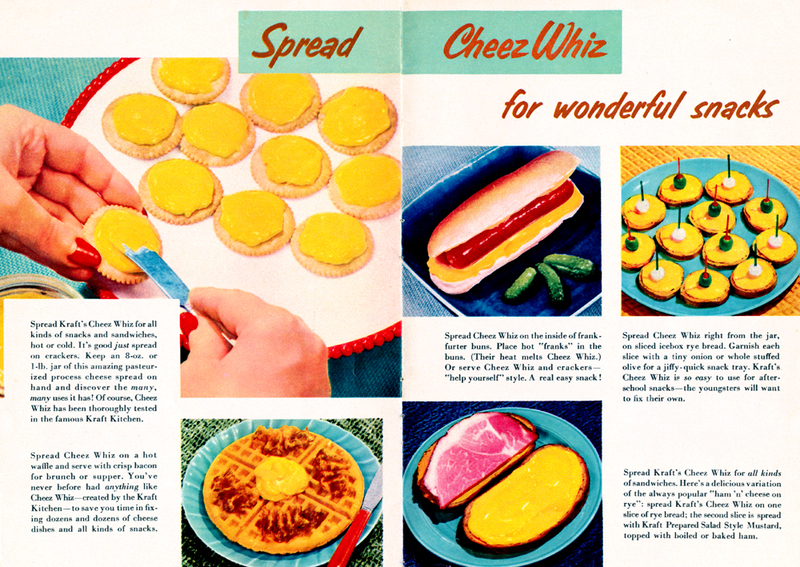 Spread the luv around and spread some Cheez Whiz for wonderful snacks. Is it me or do the brilliant golden tones make every dish look magnificent? Whoo hoo! Cheez Whiz on Ritz, a blob of the stuff on a waffle (with bacon! ), the Whiz oozing out beneath an all-beef-byproducts frank, Olives pinned to Cheez Whiz painted rye bread and the piece de resistance, a gristly slab of ham about to be sandwiched between Cheez Whiz coated bread. Repulsive? Yes! Do I want to eat them? Yes! All of them? YES! When? FOREVER! Recipes include Cheez Whiz Crackers, Waffles a la Whiz avec Bacon, Cheez Whiz Dirty Water Dogs with Gherkins, Cheez Whiz Olive & Onion Appetizers and Ham Slab Sandwich au Fromage with Cheez Whiz.